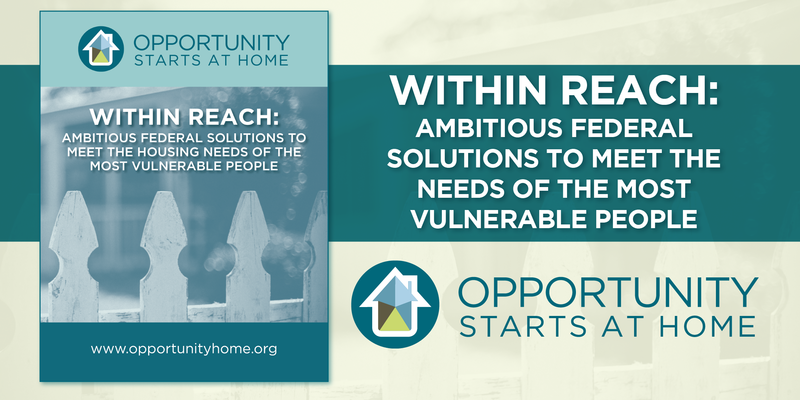 Washington, DC – Today, leading national organizations from the housing, education, health, civil rights, anti-hunger, anti-poverty, and faith-based sectors released a new report which calls for an ambitious federal response to the nation’s housing affordability crisis. The report also identifies short-term priorities that Congress should act upon immediately, such as creating 500,000 “Opportunity Vouchers” designed for families with young children to expand their access to high-opportunity neighborhoods and increasing annual funding for the national Housing Trust Fund to $3.5 billion. The report also showcases research demonstrating that housing is a critical driver of outcomes in many other areas of life: education, health, civil rights, food security, poverty reduction, and more. Stakeholders from these different sectors are increasingly recognizing the importance of affordable housing to their own priorities and goals, and through the Opportunity Starts at Home campaign, powerful new partners are working shoulder-to-shoulder to broaden the housing movement. “Providing remedy to the deep resource disparities we experience in our schools along racial lines is a priority for educators because we have a unique understanding of the impact housing policy has on our schools,” said Lily Eskelsen García, president of the National Education Association.